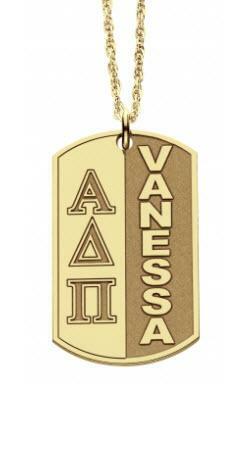 This classic style dog tag necklace is personalized with your sorority or fraternity Greek letters and your name. This sleek design splits your dog tag into two parts. One part for your name to be engraved and the other part for your Greek letters. Choose your metal type from sterling silver to gold, includes a 16 or 18 inch chain and measures at 30 x 18mm (1 3/16 in x 3/4 in). Surprise your new pledges with these dog tag necklaces that will keep you connected to your brothers and sisters for years to come. Place your sorority or fraternity and your name in the text block exactly as it is to appear. Price: $150.00 In stock! - Browse this brandOur products are custom made to your specifications. This product ships up to 3 weeks after your order is placed.